Canada's biggest city and financial hub, Toronto, or as Canadians refer to it TO, has an excellent and large CBD to be explored along with fine shopping, tourism and nature to be enjoyed. Added to this, Toronto is possibly one of the cleanest cities in the world, making it all the more pleasurable! The zoo is actually located outside Toronto in Scarborough and is a great day out for families with children. The zoo is one of the largest in the world and boasts animals from all corners of the globe. Toronto's huge amusement park. Take break from the city and go for a enjoy over 50 of Canada's best known rides. Kensington Market is located west of Spadina Avenue and is a true representation of Toronto's ethnic community. You'll find goods related to the arts and music, fashion, film and a variety of ethnic foods at the Kensington Market. Well worth a look. An hour and a half out of the city and you are at the world famous Niagara Falls. Situated on the border with the United States, Niagara Falls is definitely more enjoyable on the Canadian side. 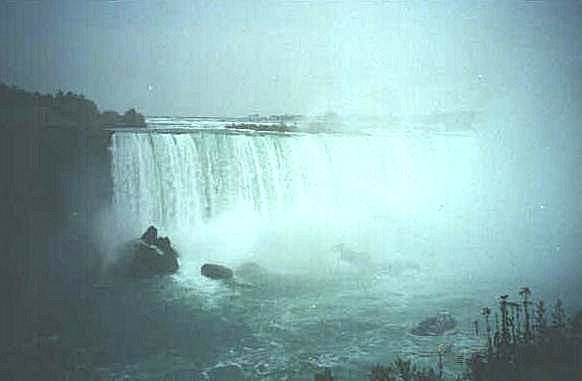 You can walk under the falls for a price or wager some money at the Casino in town but the most notorious activity is to go for a ride on the Maid of the Mist. This boat will take you close to the falls so that you truly appreciate their size. The town itself is dubbed the "honeymoon capital of the world". This may have been true a decade or two ago as the hotels and restaurants are now very dated and not entirely what you would expect for that special holiday. This park in the Eastern part of the town on Lake Ontario is huge and excellent for a walk along the boardwalk, picnic and to take the sun watching the locals play. There are tennis courts in summer, an ice rink in the winter and plenty of paths for roller-blading. The park is a great viewpoint for Lake Ontario. If you fancy a dip you may be disappointed as the water is not very clean and we certainly don't recommend you jump in. The world's longest street. It is over 1.100 miles! Pick a part and walk for a few blocks and you will be treated to views of the modern skyscrapers and mirrored buildings filling Toronto. 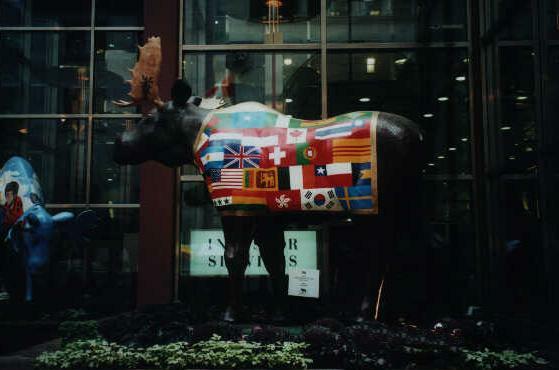 Look out for the brightly colored Moose erected on the street corners! Now a museum, this building dates back to the beginning of the 1800's and is one of the oldest buildings in Toronto. Visit this street market - your mouth will be watering for the likes of T-bone steaks and fresh terrines. One of North America's largest Chinatowns, be sure to stop off here for some of North America's finest Chinese food. You can spend the day here relaxing, catching some rays and enjoying the view over the lake. You can go for a boat ride or check out the antiques. The city has a wealth of entertainment going on year-round. The Toronto Maple Leafs play hockey from October to May at the Air Canada Center. The Toronto Blue Jays play baseball from March to October at the Skydome.The Toronto Raptors play basketball from October to May at the Air Canada Center. Toronto is now a favorite alternative to New York for many things but most importantly - the shopping! There are malls open seven days a week and if you fancy shopping on those cold snowy days go underground! There is an underground walkway that links a few hundred shops and restaurants. This starts at the Union Station so you will not even have to put your nose out into those blizzards! This park is over 100 years old and is home to some beautiful greenery and of course squirrels. Why not take a stroll through or pack a picnic lunch and get away from the hustle and bustle of the city. This is your chance to see your favorite actors and actresses in the flesh. 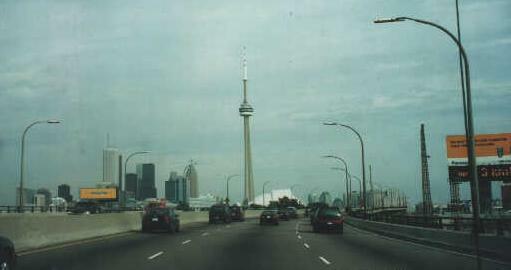 Films are now often shot in Toronto and the film making industry is booming. If you like golf, then Toronto has plenty to offer the avid golfer. There are over 50 golf courses in the Greater Toronto area and some notable ones are Geln Abbey in Oakville and Angus Glen in Markham. Drink a Canadian beer, you'll like it. The most popular Canadian beers available include Molson's, Labatts and Sleemans along with a wide range of local micro-breweries. The Canadian beers are completed by the usual array of international imports widely available in Toronto bars and at the Beer Stores. Although Toronto Bagels aren't as good as Montreal's, they are a delicious option for breakfast or lunch. There are plenty of stores selling bagels and plenty of diners with bagel sandwiches on the menu. Toronto is cosmopolitan - Italians, Greeks, Chinese, Poles, Brits, South Africans - the list goes on. Needless to say there are restaurants to please every palette - adventurous or not. For those of you who are interested, there are some excellent Greek restaurants on The Danforth (east of Yonge) and good Italian food in Little Italy at Bathhurst and College. Chinatown also also has, as would be expected, a host of Chinese restaurants, always a popular choice. Like the rest of the country, Toronto loves their breakfast. Eggs, bacon, potatoes, beans and toast. Don't forget the waffles and pancakes. You can have your fruit and muesli if you are a health fundi. There are loads of hostels around town. Prices vary from hostel to hostel but are generally affordable. Search for and book a Toronto hostels. This city has all the usual options - go online and book ahead or make your decision when you are there. Remember that proximity to the city or tourist hotspots will always be more costly so keep this is mind when you are looking at the choices. F Many of the main hotel sites will have listings for you in Toronto. Find Toronto Hotels. Located about 45 minutes out of the city centre Pearson Airport is busy and stressful. There are coaches running to and from the airport on a regular basis. You can find out more at GTAA. The national carrier of Canada can be found at www.aircanada.com. As any major city, taxis will take you from A to B in a jiffy but are not the most economical means of transport. If you rent a car get ready for traffic. The city gets quite congested during rush hour and on weekends and progress can be quite slow. Pay close attention to parking signs and observe the speed limit, if not you'll pay! Toronto's people are typically Canadian to strangers. Curious and friendly they will provide assistance when needed but sometimes they may be a little bit overly friendly. Just be polite and walk away. Canadian Dollar split into 100 cents.